I haven't done an income entry in awhile, mostly because it can be so awkward! I don't like to talk about money because Beachbody coaching to me is not about money, it's about PEOPLE! I am not going to talk much details on this post but refer you to past entries! If you would like to see my 1-4 month income, 6-7 month income or 8-9 month income progression, you can click on the pink hyperlinks for each one. It goes into a little more detail about the income, how to earn and breaks down each category of paycheck. I want to talk about how this opportunity has changed my life! I was able to quite my full time job by month 9 and create serious freedom for my family and just plain freedom of TIME! The best part is that I get to help my coaches build towards the same goal, everyday. I mean that is the BEST part of this and I feel RESPONSIBLE for passing this opportunity onto others. This is NOT a get rich quick scheme. This is about helping others and about consistent work to see the fruit of your work overtime. It's not easy but is very simple. If you are apart OUR team, you get all of my resources so you don't have to recreate the wheel, training, continued education, simple tools of how I have built my business, community and TONS of support! When was the last time you got a 2,368% raise? You know YOU can change the course of your life with just one decision. My only regret was not making the decision sooner! If you would like to join OUR team and take steps towards not only changing your life but others too, please click the picture above and apply using the online form! **Beachbody does not guarantee any level of success or income from the Team Beachbody Coach Opportunity. Each Coach’s income depends on his or her own efforts, diligence, and skill. 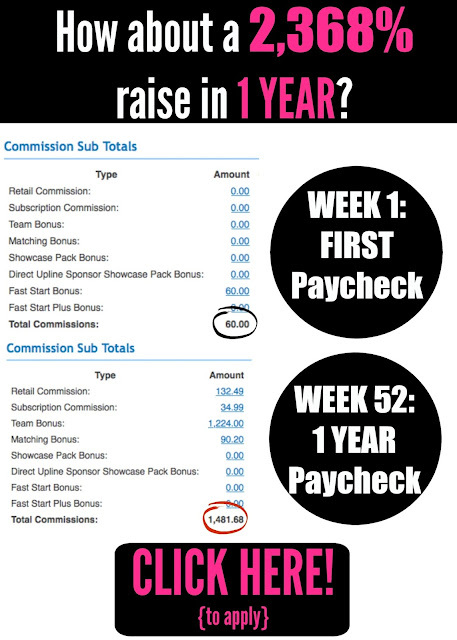 See our Statement of Independent Coach Earnings located on the Coaches Corner on TeamBeachbody.com for the most recent information on our Coaches’ actual incomes. One of my new favorite Shakeology mixes! 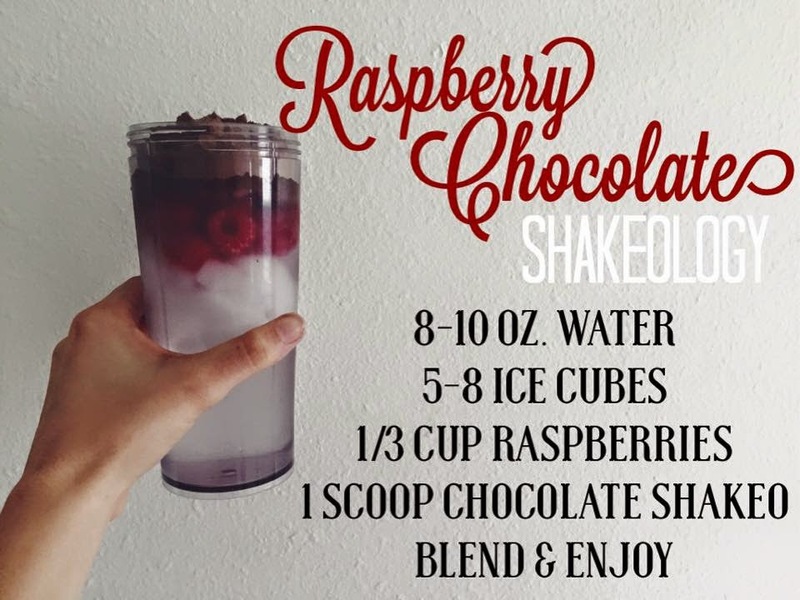 You know those little Ghirardelli chocolate raspberry squares? Well enjoy a tall glass of it but with all your daily dose of superfood nutrition. Don't know what is the deal with this Shakeology junk? Well in short, it changed my life :). If you want to know more about Shakeology and the benefits, email me at shayphillips.bb@gmail.com. This is such a SIMPLE and easy recipe. I am all about easy and simple. I will be honest, I am the worst at measuring or making recipes exact so this recipe really doesn't have much measurements but hey even better, right?? Next time I make this, I will take step by step pictures for you but for now this is all I got for you. 1. 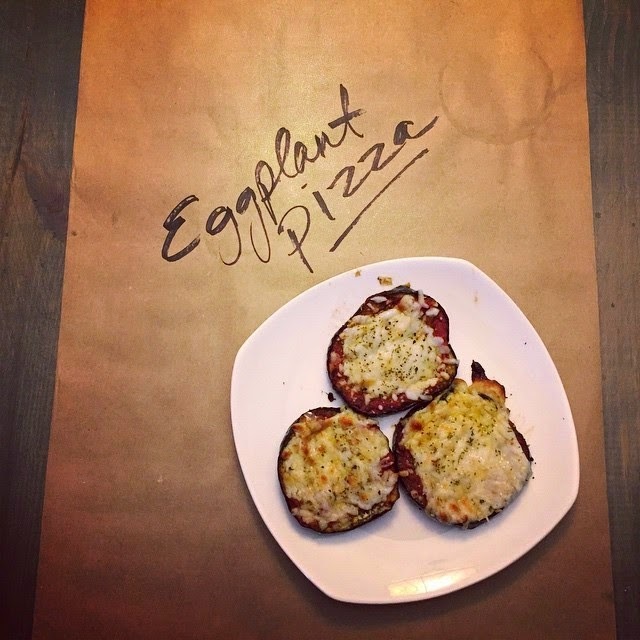 Start by cutting the top and bottom of your eggplant off. Then cut the eggplant into about 3/4 inch slices. 2. Place on baking sheet and brush tops of eggplant with olive oil. 3. Shake some dried basil (or fresh or Italian spice or whatever you like) on top of each eggplant slice. 4. Bake at 375 for no more than 25 minutes. Too long and they get mushy! 5. Pull out of the oven and top with a light layer of sauce. I literally pulled out a random jar of pasta sauce out of our pantry. We keep it simple around here! 6. After a thin layer of sauce is applied, top with a generous amount of mozzarella cheese and additional dried herbs. It would be really great with fresh herbs, prosciutto and cherry tomatoes! But again simple here haha. 7. Place back in oven and broil till cheesy is lightly browned and bubbly. Not very long maybe 5 minutes tops. Confession...this the first time I have ever used the broil feature on my oven. Seriously??? It is awesome! There is way more fancy ways you can make these little guys but I worked with what I had on hand. They were delicious and I wasn't even jealous of my hubby eating baked ziti across from me. How in the world is summer already here? Oh my goodness! Can I be honest with you? I don't feel ready! I worked my booty off (literally) before our cruise to get in optimal shape BUT I am human and getting back on the wagon after multiple back to back vacations is HARD. The only thing that gets me back on the wagon and pushes me daily are these challenge groups. I am dragging behind the wagon right now but my friends are keeping right there with me pulling me up. I know that if I give my all for 3 weeks that I can be back to where I was or even farther along! Seriously all you need is 3 weeks to see incredible change. I promise you! BUT you have to put in the work and make a lifestyle shift and be committed. I need accountability daily to be all in and maybe you do to. I am hosting a 21 day challenge starting June 1st and ending on June 21st. You know that June 21st is the first day of summer??? That way you can hop out on the beach and feel good about doing so. Not just externally but internally as well. I am committed to helping you make big changes in 3 weeks from the INSIDE -> OUT. I will be keeping this group smaller so that we can be laser focused, so I am only reserving 8 spots! To snag a spot please click the picture above and fill out the application or comment below by May 25th with your contact information. I can't wait!!! Let's do it together! It's only 3 weeks and then we arrive at summer. So I have been in a little work out slump. I will be honest! Ever since we got back form vacation it's so hard to get back on the wagon. Something that have been motivating me BIG time is Beachbody On Demand. 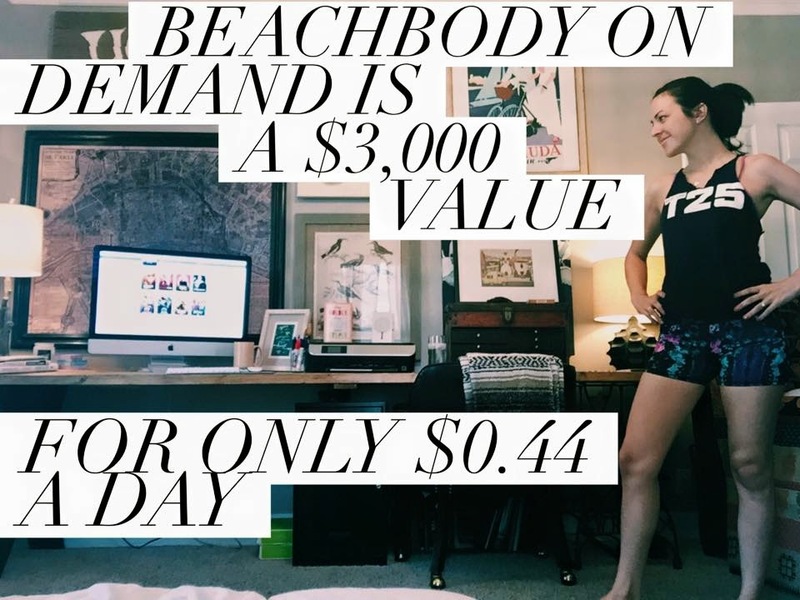 So what is Beachbody On Demand?? Well it is a streaming option that Beachbody offers that you can access anywhere, anytime! How cool is that? The best part is that it has a library jam packed of awesome, world class Beachbody programs valued at over $3,000 dollars if you owned them all on their own. Plus so many ones that haven't gotten to try yet so you never get bored! You know what else is really cool. If you ever purchased a Beachbody program that isn't quite available through the on demand portion, then they add it to your account so all of your programs are in one place. So neat!! So it much be a fortune? Nope, it's literally $0.44 a day for access to 100's of work outs, meals plans and options. No gym, minimal equipment, access to world class trainers and meal plans, at just $0.44 a day. P90X3 work out with Tony Horton has been my FAV lately!! So if you have been following for awhile you know that we have been renovating our 1930's bungalow. When we first got in, we went full force trying to complete every project that came our way. We seriously love DIY house stuff! But as life got busier and time got away from us, the projects just have piled up. GAH! My flowers might be dead but hey I will trade dead flowers any day for spending more time with my family. Sometimes what we think are priorities, simply aren't. We will keep you posted on our home progress and new DYI projects.